Kaslo Jazz Etc. Festival Camping FAQ and Reminders! Q: How much is a camping pass? Are there single day camping passes available? South Beach Campground: $150.00 all tax and fees included. Jazzlo Bay Campground (GENERAL): $200.00 all tax and fees included. Jazzlo Bay Campground (UPGRADED): $300.00 all tax and fees included. All Camping Passes are good for Thursday, August 1st at 2pm – Monday, August 5th at 11am. Camping passes are for the entire weekend only. Q: When do camping passes go on-sale? A: All camping passes go on-sale February 14th, 2019. Q: When do the festival campgrounds open? A: Campground gates opens at 2pm Thursday August 1st. All campers must be gone by 11am Monday August 5th. All camping attendees MUST be 18 years of age or older & have a valid I.D. or be accompanied by parent or legal guardian. NO exceptions. Q: Why is Kaslo Bay Campground different this year? A: Kaslo Bay Campground has previously been run by a third party, but as of this year Kaslo Jazz Etc. Festival is now running the Kaslo Bay Campground. We are calling it Jazzlo Bay Campground! There will be significant and exciting changes to the campground as we move forward. Jazzlo Bay will be two camping areas this year: Jazzlo Bay (General Camping) and Jazzlo Bay (Upgraded Camping). Please see the Jazzlo Bay Camping Page for details on the new camping set-ups and perks! Q: Have many people are allowed per campsite? A: 4 people per campsite max = one Camping Pass. Camping Pass is per vehicle for South Beach and Jazzlo Bay Campgrounds. 4 people max per vehicle. Extra people require extra passes, for all campgrounds. Children 12 and under count for half occupancy towards the max 4 persons per camp site, rounded up to the closest whole number. Q. Can I reserve my campsite? You cannot reserve a space in any of our campgrounds ahead of time. Please arrive with your entire group if you want to guarantee camping together. *The Only exception being Jazzlo Bay “UPGRADED” Camping Passes for 2019 transition year! Q: Where are the Kaslo Jazz Etc. festival campgrounds? How far are they from the festival grounds? Can I walk or bike? A: All of the festival campgrounds are within walking distance to the festival grounds. 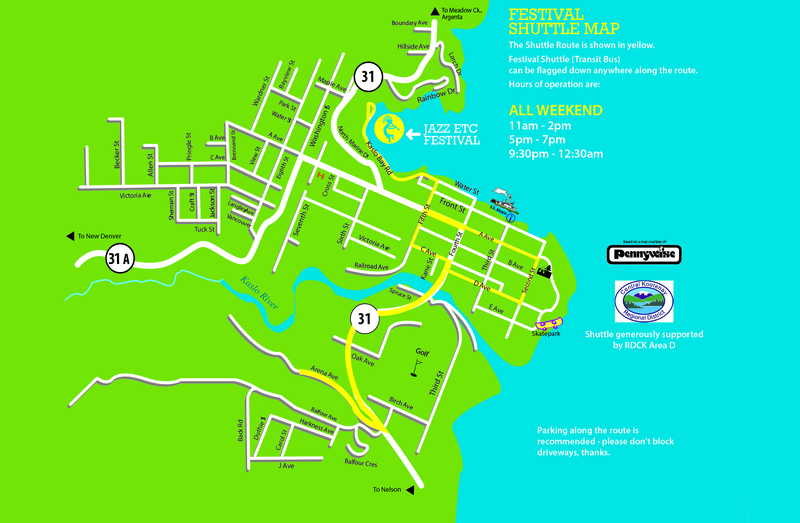 Jazzlo Bay Campground is the closest to the festival as it is directly above the grounds. 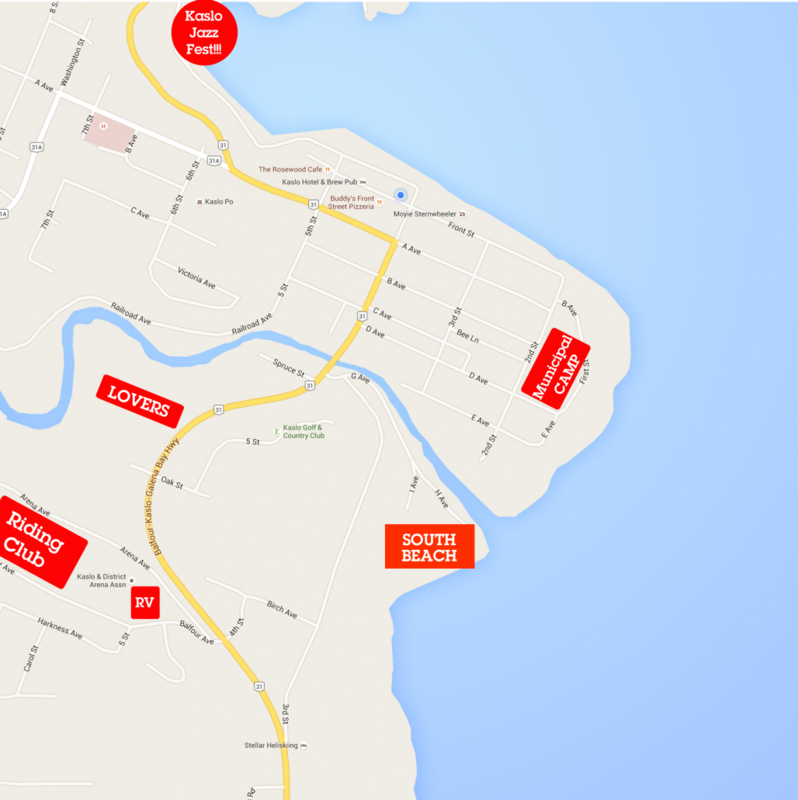 South Beach Campground is 2km from the festival site (aprox. 15 min walk) and Lovers Wilderness Campground is just under 2km from the festival site (aprox. 10 min walk). Kaslo Arena RV Campground and Kaslo Riding Club Campgrounds are 2.5km from the festival site (aprox. 25 min walk) Yes, please bring your bike! There are no vehicles permitted on the dirt road to the festival so we encourage biking to and from the festival/campgrounds. We provide bike racks outside the main gate at the festival. We also provide a free shuttle. See below for details. Q: Is there a shuttle from the campgrounds to the festival grounds? Q: I bought a camping pass but am no longer able to attend the festival/have somewhere else to stay, can I get a refund? Q: Can I purchase a camping pass when I arrive? A: Yes! Subject to availability, Campground tickets may be available at the campgrounds starting August 1st at 2pm. That said – many of the campgrounds sell out in advance! Grab your tickets and guarantee your spot here: Tickets Page. Q: Do I need to bring my camping pass to the campground? A: Yes. Once you have bought your camping pass, you can either print it out or download it to a smart device and bring it to the gate. Remember: All camping attendees MUST be 18 years of age or older & have a valid I.D. or be accompanied by parent or legal guardian. NO exceptions. When you arrive at one of the festival campgrounds you must present your valid I.D. to match the name on our list and your camping pass. Q: I’ve bought my camping pass but can’t arrive when the campground gates open. Am I still guaranteed a spot? A: Yes. If you have purchased a camping pass you will get a spot. It just isn’t guaranteed you will be beside your crew as it is first come first serve for campsites for pass holders. Q: Can I have my vehicle at my campsite? Can I have my vehicle AND my RV/trailer at my campsite? A: You can only bring one vehicle per campsite (except Lovers Wilderness which is tent camping only). If you have a vehicle separate from the vehicle that will be at your campsite, then you must park it outside the campground. Q: Can I take my vehicle out of the campground after I’ve entered? A: No. Once you have parked your RV, trailer or vehicle at your campsite it must remain there until you leave. If your vehicle exits the campground before the end of the festival your vehicle will not be granted access back in and you will lose your camping spot. Only emergency vehicles can enter and exit throughout the weekend as necessary. Q: After I drop my RV/trailer off at my campsite, where do I park my vehicle? A: If your vehicle is separate from the vehicle at your campsite, you must park outside of the campground. There is free parking all around Kaslo. Q: My friends are arriving before/after me. Can we still camp together? A: Campsites are first come first serve and there is no guarantee that you and your friends will be able to camp beside each other. We do not reserve campsites. Best to plan to arrive at the same time! Q: I am volunteering/vending at Kaslo Jazz Etc. Festival. What do I do about camping? A: Camping is not included for volunteers or vendors. You can purchase your camping pass (good for the entire weekend) through our Tickets Page. Q: The festival was so fun! Can we keep the party going at our campsite? A: We enforce quiet time at 12AM at all festival campgrounds. This means no loud noise, partying, music, or playing of instruments after midnight. Please respect your neighbours and keep your after partying for the after parties KJEF provides and not at the campgrounds. If you do not abide by these rules you may be asked to leave the campground. Q: Can I bring my dog to my campsite? A: No. There are no pets (service animals are the exception) allowed at any of the festival campgrounds or the festival grounds. Q: What party supplies can I bring to the campgrounds? Q: Can I bring friends that aren’t staying at the campground to visit? A: Yes. You may have visitors at your campsite until 12AM when quiet time is enforced. No one without a campground wristband will be permitted into the campground after 12AM each night. Q: Are there washroom facilities at the festival campgrounds? A: Yes. All our campgrounds are fairly rustic but we do have toilets/hand washing stations, including accessibility washrooms and flush toilets at most of our campgrounds this year! Q: Are there Showers provided at the festival campgrounds? A: Yes! There are pay-per-use Showers at Jazzlo Bay (GENERAL) and Southbeach Campgrounds. There are FREE showers provided at Jazzlo Bay (UPGRADED) campground. Swimming in Kootenay Lake will also keep you fresh! Q: Where is the best beach to swim at in Kaslo? A: South Beach has some of Kaslo’s finest sand, waters and views. Be aware however there are No Lifeguards On Duty. Swim At Your Own Risk. Although South Beach is further away from the festival grounds, it can be a refreshing, quiet reprieve from the bustling town and festival in between seeing your favourite acts! Q: Can I have a campfire or propane fire? A: No. This is very important. Kaslo Jazz Etc. Festival occurs during the regions most vulnerable fire season. Due to this extreme danger, absolutely no open fires or propane fires are allowed at any festival campgrounds. Small cooking stoves are acceptable. Please use these with extreme caution and please be very careful with smoking or any other flammables at this time! Q: Can I bring a small generator? A: No generators are allowed at any of the festival campgrounds. Q: What services are provided at the campgrounds? A: Safety is of the highest priority to the Kaslo Jazz Etc. Society and we provide 24 hour First Aid and Security at South Beach Campground. Kaslo Jazz Etc Society is not responsible for any materials misplaced, lost or stolen. It is recommended you don’t bring valuable items. If you do, please lock them in your vehicle for safety. Q: Can I buy food at any of the campgrounds? A: Yes! There will a local food vendor at our South Beach Campground all weekend long. Stay tuned for more details! Items not listed on this outline may still be prohibited, so please Contact Us if you have any questions!